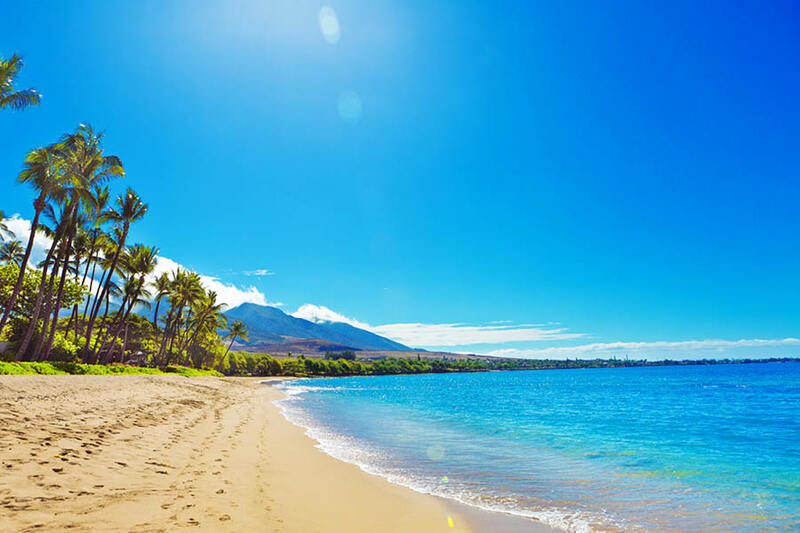 Due to its close proximity to the equator, Hawaii’s weather is consistently warm and tropical. There are two distinct seasons throughout the island chain, however both are relatively warm. Average daytime temperatures sit around 29°C during summer and 26°C in winter. The islands of Hawaii all boast their own microclimates. Depending on which island you stay on, you’ll notice unique environments and diverse weather patterns. The coastal plains and mountain slopes support luscious, moist rainforests, plus there are dry desert lands on different elevations due to volcanic shielding and activity! Frequent trade winds influence Hawaii’s weather patterns. High-pressure zones in the north pump cool, moist winds into the slopes on the north-eastern side of the islands. These winds lead to clouds and rainfall cultivating beautifully green settings on once-volcanic land. This fascinating weather phenomenon is common on the windward side most of the islands, though it is most dramatic on Kauai and Maui—the Garden and Valley Isles known for their waterfalls and lush forests. The leeward sides of Hawaii’s islands, in the west and the south, are shielded from the wind by volcanoes. Without the wind’s reach, these areas miss the rainfall and are, therefore, generally more hot and dry. Wave patterns vary on each side of the islands too—for example, surfers should note that swells are largest on the north-west coastlines in the winter months, before switching to the south-east coastlines in the summer months. 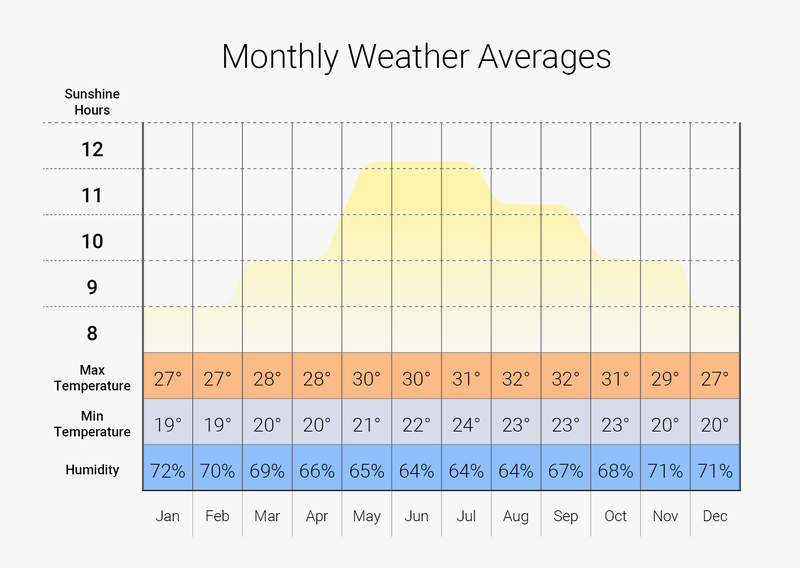 Hawaii’s summer extends from May to October and temperatures are consistently warm. Daytime temperatures average 29°C and drop to an average of 23°C in the evening. Trade winds provide a constant cooling breeze during these months, plus water temperatures are ideal for swimming, snorkelling and diving! If you’re planning to surf during summer, head to the south-east coasts for the bigger swells. Waikiki is a great place to find your feet during these times! Winter, from November to April, is Hawaii’s wet season. Trade winds blow the rain predominantly to the north-east coastlines during these times, though the rainfall is generally quite localised and short-lived. The rain will not dampen your holiday, plus temperatures don’t change drastically from the warm days of summer. If you feel the cold, take a light jumper to ensure the average 20°C in the evenings and, if you’re hunting the big waves, head to North Shore, Oahu to surf with the pros! At My Hawaii, we think that the best time to visit Hawaii is all the time! Winter is the peak period for hotels, with many tourists making the most of the Christmas holiday season and Hawaii’s eternal warm temperatures. If you’re looking to avoid the crowds, the weather is perfect year-round—there’s always an ideal beach to swim at or volcano to hike! Some things to consider when planning your trip include which islands you want to visit and what events, festivals and experiences are at each of them. Expert advice and Hawaii holiday tips are just a phone call away! Our exclusive Hawaii Hot Deals offer unbeatable value at the best Hawaii destinations. Complete with money-can’t-buy bonus inclusions, these deals will take you on the Hawaii holiday of a lifetime! Remember, if we wouldn’t stay there, you won’t find it at My Hawaii!